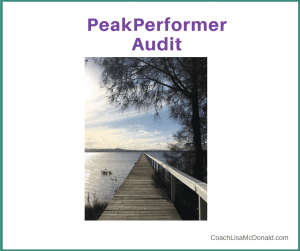 The PeakPerformer audit is an important tool for assessing where you are in your life right now so that you can move towards achieving what you want in the future. It looks at eight key areas of your life, with a strong focus on vitality, performance and lifestyle aspects. The audit will highlight areas of your life which require some work – areas that you may not have even thought of before. Evaluating your life as an integrated whole, enables you to tailor successful solutions with your individual needs and goals in mind. When you have a clear snapshot of your current life’s strengths and weaknesses, you can begin to make the changes that count – not just cosmetic changes. Why a PeakPerformer Audit? Why you? Why now? I’m committed to assisting women and men to towards expanding their dreams, innovations and peak performances. The PeakPerformer Audit is about assisting you to develop key performance areas of your life so you can achieve maximum results. It’s about evaluating, aligning and harnessing what matters most in your life so that you generate optimum power and energy for driving your performance and reaching your full potential. What is a PeakPerformer Audit? 3. Lifestyle – fulfillment, spirituality, quality of life, rejuvenation and enjoyment. Once you have identified where you are right now, we will then work with you to identify where you want to be in each key area of your life. Then, you will map out a step-by-step plan to guide you to your destination and create the life that you want. You will be taken through a five page audit which assesses your current performance levels in 8 key areas of your life. In this revealing process, you will evaluate your results in line with you priorities and future aspirations. Now that you know where you are, and where you want to go, the next and most important step is to set up an action plan. The fact is that most people know what they should do, but they don’t do what they know. By taking at least three actions at the end of the session you will be committing to making changes – for good! Expand your potential by booking your PeakPerformer Audit today!